If you didn’t watch the Screen Actors Guild Awards or just wait to relive the best moments, check out my recap (where I point out all of the important things that happened). 1. 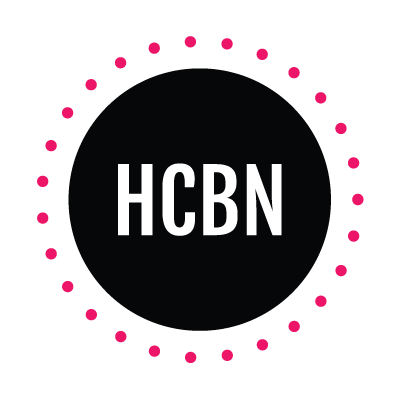 First things first, where is Giuliana Rancic? Add drink every time Maria Menounos makes a celebrity feel uncomfortable to my drinking game. (Giuliana has never had a celeb deny her the Mani-Cam). 2. These plants make it look like E!’s red carpet is Live from The Home Depot. 3. 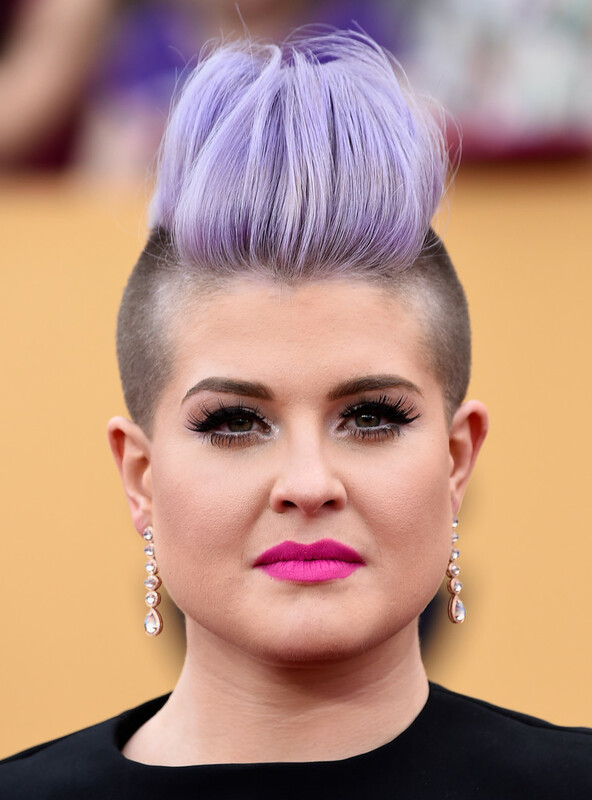 Kelly Osbourne’s hair is so big because it’s full of secrets. 4. Amanda Peet, Maggie Gyllenhaal, Jennifer Aniston and Taryn Manning put the sag in SAG Awards. #NoBrasNoProblems? 6. Fiona Gallagher did leave the South Side for this. 7. Carrie Mathison’s smiling like she knows the true behind the Patriots ball scandal. 9. Congrats Uzo! Maybe now that you’re a winner a designer will give you a dress that doesn’t look like yellow fish net or an old rag. 10. William H Macy IS Frank Gallagher. 11. I don’t know who anyone from Orange is the New Black is without their prison jumpsuits. (Except for Mimi from Crossroads, duh). 13. 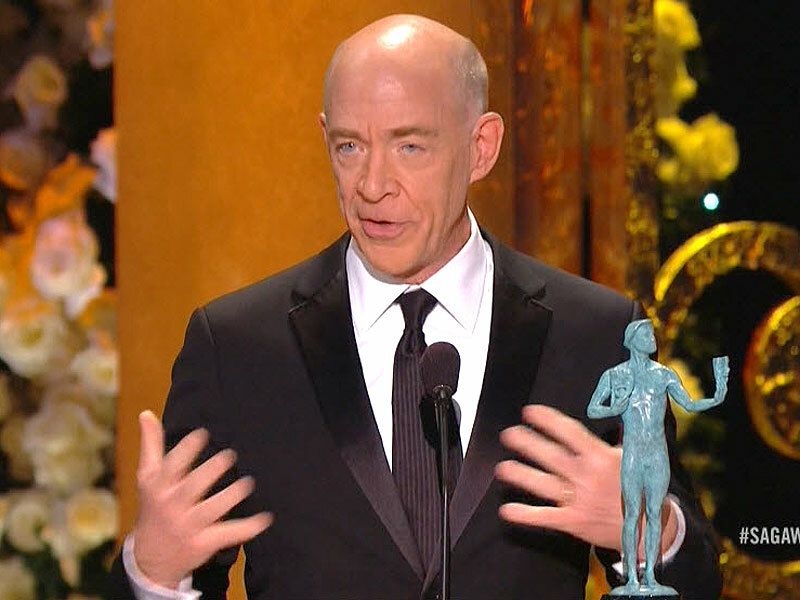 Juno’s dad won an award! 14. Jared Leto and Lupita Nyong’o need to date ASAP. 15. I can’t see Benedict Cumberbatch without thinking about Blake Shelton. 16. Carrie Fisher is like that jealous maid of honor who wishes she was the one getting married. Sidenote: is she wearing #3D glasses? 17. McSteamy is McSliver and it’s McAwesome. 18. Frank Underwood obviously couldn’t be there because he’s busying running the country. (Only 32 days until House of Cards is back!). 19. Who is this Amish/punk chick? (The risk of filming a movie over 12 years is not knowing how the child stars are going to turn out). 20. 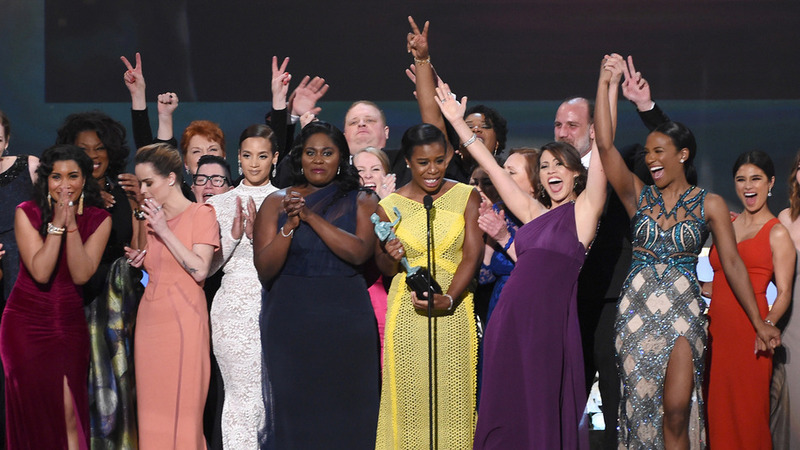 Orange is the New Black is winning everything! Too bad I can’t take the guard seriously after this. 21. Sofia Vergara just roll her eyes at Julianna Margulies/ The Good Wife? Because nobody messes with Alicia Florrick. 22. Do Viola’s arms have their own twitter account yet? 23. Rashida Jones and Andy Samberg are trying too hard to be funny. Their glasses are just trying too hard. 24. Eddie Redmayne’s reaction was so Taylor Swift. 25. Is that Andrea Zuckerman at Jennifer Aniston’s table? 9021-what the hell? 26. Julianne Moore is a cool mom. 27. If Emma Stone was trying to pull a Tonya Harding, she did a good job covering it up. 28. I’m happy Zach Galifianakis is one of those people who can be skinny but still be funny. Only two weeks until the Grammys!